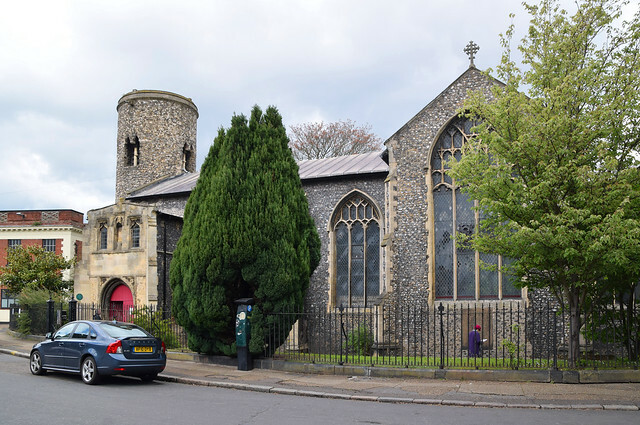 Although St Mary Coslany is one of 36-odd surviving medieval parish churches in the centre of Norwich, it is so old that it actually predates that time, and was probably the original parish church of the Anglo-Saxon settlement of Coslany. Coslany became an area of factories, warehouses and breweries. The one to the west of the church is the former printing works of a religious publishing house, and is so big it also abuts the churchyard of St Martin at Oak. The three surviving Coslany churches are all redundant today of course, and St Mary has been redundant for the longest. This is the last surviving medieval round-towered church in the city. 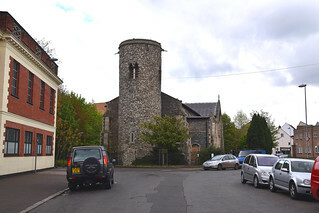 St Benedict's round tower survives, but not its church. Nearby St Paul and its round tower were lost to a combination of German bombing and urban planning, and the tower at St Julian is a modern construction. As at St Peter Hungate, which this church much resembles internally, St Mary has the elegance of a small, cruciform church, quite the prettiest of the north-central churches, I think. 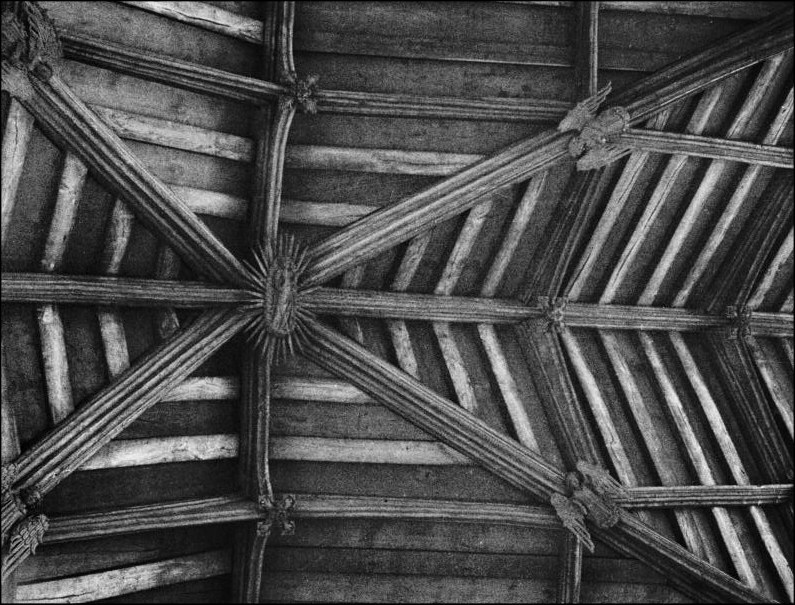 Its great treasure is the roof, which is still largely medieval and has a boss of the Assumption of the Blessed Virgin into Heaven crowning the central crossing. Although St Mary had been derelict by the end of the Victorian era, it underwent a major restoration in the early years of the Twentieth Century. 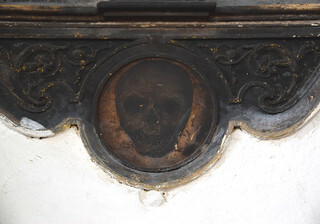 This was perhaps a result of the evangelical enthusiasm which also saw the restoration of St Swithin. However, the church had fallen out of use again by the Second World War. 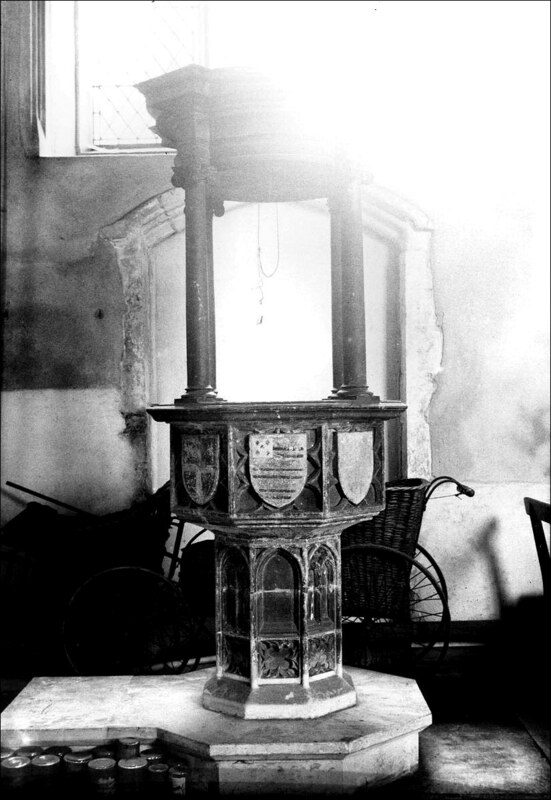 Even after the 1908 restoration, the tower had not been considered safe enough to ring the bells, and in 1937 they were taken down and rehung in the massive new church of St Catherine at Mile Cross to the north-west, where they still ring out today, albeit hammered rather than swung. St Mary got off lightly during the Norwich Blitz, for the bombs of January 1942 only destroyed part of the roof and damaged the crossing. 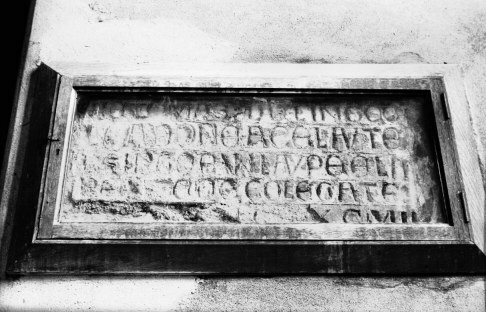 The church was restored to use, but finally declared redundant for the last time in 1967. 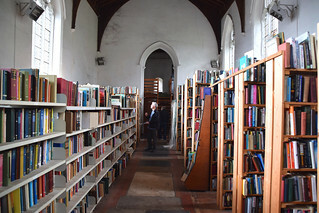 After serving as a craft centre for a number of years, St Mary Coslany is today the offices and warehouse of an internet bookshop. 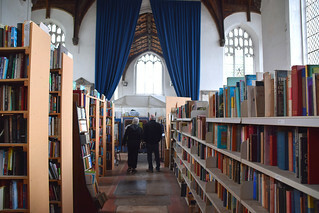 It is a rather surreal space to step into, because the nave is entirely crowded with shelves of books, and the chancel is filled by a large tent-like structure which you have to edge around. Only the transepts are relatively clear. 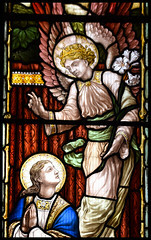 All the glass is by J&J King of Norwich, and dates from the 1908 restoration. Some of it is interesting. 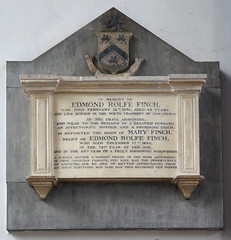 That in the north transept remembers Members of the Norfolk and Norwich Archaeological Society, who perhaps contributed to the cost of the restoration. 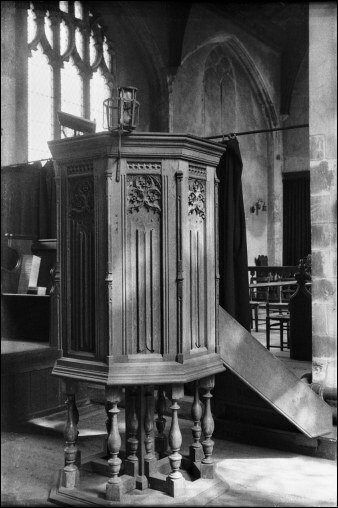 In the chancel, there is a surprisingly tall and narrow Annunciation. The figures of St Thomas and St John must already have seemed dated, but there is a freshness to the coat of arms in the north transept. Perhaps the most interesting surviving features are a 1605 brass to Ann Claxton, and the memorial to Martin van Kirnbeck, who died in 1579. The figures are incised into the stone. 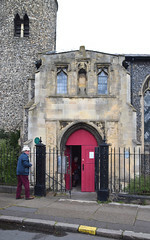 The church presence in this part of Coslany is today maintained by the huge Norwich Central Baptist Hall directly opposite, and a smaller Elim Pentecostal church which today uses the former parish buildings. 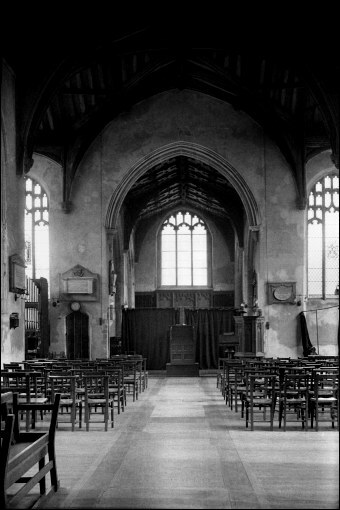 George Plunkett's photographs of the 1930s, below, show the inside of St Mary on the eve of the Second World War. 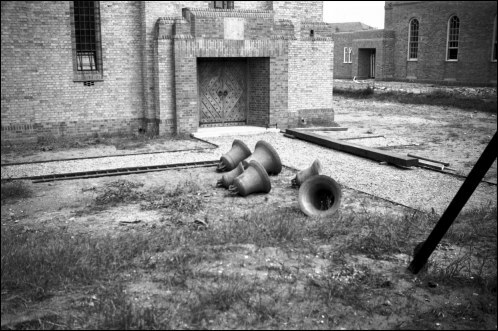 The last photograph shows St Mary Coslany's bells, removed in1937 and lying in wait to serve the brand new church of St Catherine Mile Cross in north Norwich, where they still ring out today.